Are you a mover and shaker in the world of fintech? Do you like eating cakes, biscuits and sweet treats? Or do you fancy yourself fintech’s answer to Nadiya Hussain? If you answer yes to any of the above, then we have the event for you! 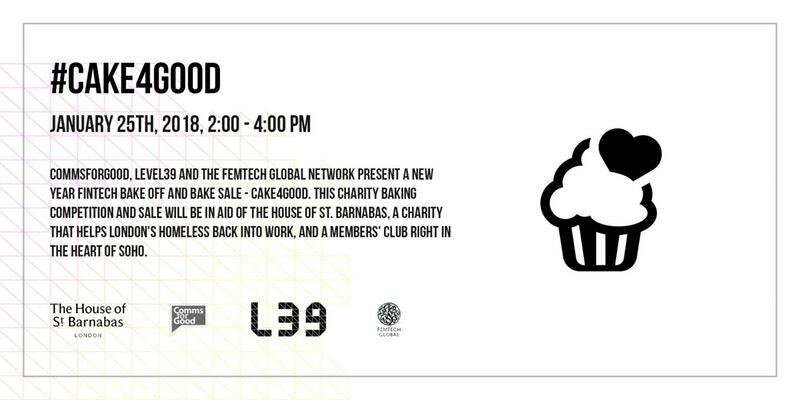 Comms for Good, Level39 and FemTech Global present a new year fintech bake off and bake sale, Cake4Good. This charity baking competition and sale will be in aid of The House of St Barnabas, a charity that helps London’s homeless back into work, and a members’ club right in the heart of Soho. Bring your own showstopper or signature sweet dish for sale and for entry into the Cake4Good bake off competition – judged by a soon-to-be-announced celebrity. Each baked entry will be priced at identified by your company logo or personal brand. While fintech is our jam, we know that not everyone is a dab hand with the wooden spoon. Cake4Good also welcomes your boxed delights – whether they’re from a neighbourhood bakery or corner Tesco Express. Donations for the sale are more than welcome. We shall enjoy all bake-it and and fake-it entries equally – however, only home baked goods will be eligible for the Cake4Good FinTech Bake Off! Sorry! No time to lay out the baking parchment or head down to M&S for a Victoria sponge? No worries, just bring your wallets with you on the day and purchase our treats donated or baked by the great and the good of the fintech community. After all it is all in a good cause! Based in Soho, The House of St Barnabas is a not-for-profit members’ club and charity pledging to break the cycle of homelessness and social exclusion through their Employment Academy. A 12-week sponsored training programme includes accredited qualifications from City & Guilds, work experience in the club, personal development, CV workshops, and real job opportunities. After completing the programme, graduates are offered an additional 12 months of mentoring and support, with a focus on work and wage progression. This ongoing assistance is vital in the lasting success of the Employment Academy’s graduates, enabling them to gain and sustain their independence. We invite organisations and individuals to work together to raise the £5,000 required to support a homeless person through The House of St Barnabas’s 12-week training programme. We use time as a yardstick. And yet we don't seem to value it. We're up for Best Event Linked to a Publication Award!